MAY 2012: A Complimentary Copy is waiting for you! Get a complimentary copy of Lighting Magazine today! What is the best lighting for a stairway with no windows and very little natural light upstairs? My current plan calls for recessed lighting. It would be best not to put recessed lighting above the stairs, because it will be difficult to replace the light bulbs. With the absence of much natural light, it would be good to use wall sconces on the stairs, and perhaps a surface mounted fixture at the top of the stairs at the landing as well as another fixture at the bottom of the stairs just above the first step. The wall sconce should have translucent glass that emits light horizontally and downward. Avoid sconces where the light is directed upward. Lighting magazine offers tips for taking the hub of your home to new heights with well-planned, beautiful lighting. A well-lit kitchen will make your family and friends want to pull up a chair and stay a while. Light can help enliven a space, making food look more appetizing and helping dark tables feel bright and convivial. The advent of slimline LEDs (many of which do not require hardwiring) means it is now easier than ever to retrofit difficult spaces, such as under cabinets, without a huge investment. A spacious kitchen needs layers of light – an overall light, task light and accent light – to be efficient and create a homey feel. Tips such as these can be found in Lighting magazine, along with beautiful photos to inspire your decorating side. Your entryway should be an inviting place with warm, enveloping light welcoming you and your guests. No other area of the house sets the mood like the entryway, both inside and outside. A dimly lit entry can seem foreboding and off putting. Fortunately, lighting is fairly inexpensive and adaptable, able to change its style at the switch of a shade or the swap of a ceiling figure. Also essential to an inviting entryway are dimmers, which allow flexibility and mood enhancing. For more ideas about lighting your entryway, as well as the rest of your home, check out the new 2012 issue of Better Homes & Gardens’ Lighting magazine. 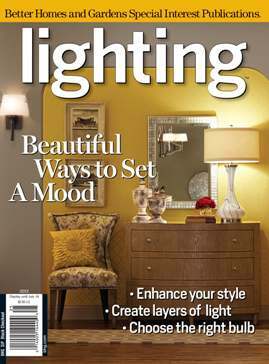 You can browse Lighting magazine online, or order a complimentary copy from ALA.